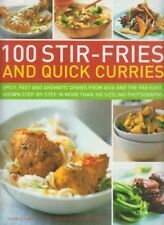 Title: 100 Stir-fries and Quick Curries: Spicy and Aromatic Dishes from Item Condition: used item in a good condition. Book Details. Publisher: Southwater ISBN 13: 9781844763863. Edition: - List Price: -. 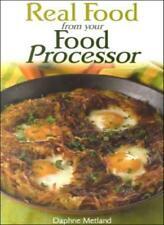 Title: Real Food from Your Food Processor Item Condition: used item in a good condition. 100 Recipes - Potatoes (Hardback)Title: 100 Recipes - Potatoes Format: Hardback Type: BOOK Publisher: Parragon Book Service Ltd UK Release Date: 20110522 Language: English. Author: Pepita Aris ISBN 10: 0749523433. 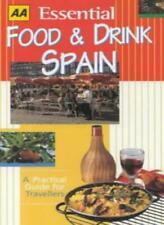 Title: AA Essential Food and Drink: Spain (AA Essential Food & Drink Guides) Item Condition: used item in a very good condition. Used-like N : The book pretty much look like a new book. Title: The Seduction Cookbook: Culinary Creations for Lovers Item Condition: used item in a very good condition. Author: Diane Brown ISBN 10: 0595298842. Used-like N : The book pretty much look like a new book. 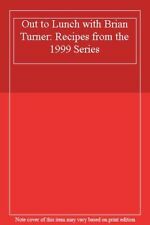 Title: Out to Lunch with Brian Turner: Recipes from the 1999 Series Item Condition: used item in a very good condition. Edition: - List Price: -. Used-like N : The book pretty much look like a new book. Publisher: Murdoch Books ISBN 13: 9781853912207. 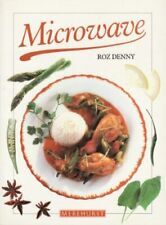 Author: Roz Denny ISBN 10: 1853912204. Title: Microwave Item Condition: used item in a very good condition. Title: Encyclopedia of Spanish and Portuguese Wine (Oz Clarke's Regional Wine Guides) Item Condition: used item in a very good condition. Used-like N : The book pretty much look like a new book. There will be no stains or markings on the book, the cover is clean and crisp, the book will look unread, the only marks there may be are slight bumping marks to the edges of the book where it may have been on a shelf previously. This book is still in very good condition. The really hungry student cookbook: how to eat well on a budget by EllenTitle: The really hungry student cookbook: how to eat well on a budget Format: Hardback Type: BOOK Publisher: Ryland Peters & Small UK Release Date: 20130711 Language: English. Death by Burrito. Author:Ola, Shay. Each month we recycle over 2.3 million books, saving over 12,500 tonnes of books a year from going straight into landfill sites. All of our paper waste is recycled and turned into corrugated cardboard. Looking for a fast, satisfying supper?. Author:Johnson, Philip. Book Binding:Paperback. Each month we recycle over 2.3 million books, saving over 12,500 tonnes of books a year from going straight into landfill sites. All of our paper waste is recycled and turned into corrugated cardboard. Author:Philpott, Pam. The Campfire Cookbook: Recipes for the Outdoors. Book Binding:Hardback. Book Condition:VERYGOOD. Each month we recycle over 2.3 million books, saving over 12,500 tonnes of books a year from going straight into landfill sites. Author:Rosemond-Hoerr, Elena. Each month we recycle over 2.3 million books, saving over 12,500 tonnes of books a year from going straight into landfill sites. All of our paper waste is recycled and turned into corrugated cardboard. Title: Indian Vegetarian Curries: Exotic, Delicious and Colourful Dishes Item Condition: used item in a good condition. Published On: 1987-08-27 SKU: 8765-9780722515129. Will be clean, not soiled or stained. Tapas: 80 of the best. Author:Farrow, Joanna. Book Binding:Hardback. We appreciate the impact a good book can have. We all like the idea of saving a bit of cash, so when we found out how many good quality used books are out there - we just had to let you know! 30-minute vegetarian by Joanna Farrow (Paperback)Title: 30-minute vegetarian Format: Paperback Type: BOOK Edition: Revised Edition Publisher: Hamlyn UK Release Date: 20040415 Language: English. Illustrated throughout, this book contains over 100 vegetarian recipes, for any occasion, that can be cooked in under half an hour. Pasta, if sales of pasta cookbooks are a guide, is up there in the top five for favourite food. 30 Minutes or Less: Sweet Food (Paperback / softback)Title: Sweet Food Series: 30 Minutes or Less Format: Paperback / softback Type: BOOK Publisher: Parragon Book Service Ltd UK Release Date: 2006 Language: English. River Cafe Cookbook Green. Author:Rogers, Ruth. Book Binding:Paperback. Each month we recycle over 2.3 million books, saving over 12,500 tonnes of books a year from going straight into landfill sites. Publisher: AWW ISBN 13: 9781863964098. Will be clean, not soiled or stained. Author:Graves, Hillary. Little Dish Favourites Cookbook: Over 60 simple recipes from weaning onwards. Book Binding:Hardback. We appreciate the impact a good book can have. We all like the idea of saving a bit of cash, so when we found out how many good quality used books are out there - we just had to let you know! Cresci; The Art of Leavened Dough. 1ST PLACE WINNER "BEST BREAD BOOK IN THE WORLD" WORLD COOKBOOK FAIR - PERIGUEUX, FRANCE, 2000. Condition: New. Factory sealed. 100 Great Risottos. Book Binding:Hardback. Each month we recycle over 2.3 million books, saving over 12,500 tonnes of books a year from going straight into landfill sites. All of our paper waste is recycled and turned into corrugated cardboard. Jordan's Country Cookbook Wholewheat Recipes. Step by Step Authentic Curries (Step by step guide series). Title : Step by Step Authentic Curries (Step by step guide series). Product Category : Books. Binding : Paperback. First Edition : False. Condition : Very Good. Pastillage and Sugar Moulding (Art of Sugarcraft S.). Author:Lodge, Nicholas. Book Binding:Hardback. Product Details Each month we recycle over 2.3 million books, saving over 12,500 tonnes of books a year from going straight into landfill sites. Authors : Catherine Atkinson. Almost Every Kind of Cookie: Make and Bake Over 100 Mouthwatering Cookies, Biscuits and Bars with 450 Step-by-step Photographs. Title : Almost Every Kind of Cookie: Make and Bake Over 100 Mouthwatering Cookies, Biscuits and Bars with 450 Step-by-step Photographs. Authors : Grossman, Loyd. Pages : 144. Product Category : Books. First Edition : False. Dust Jacket : False. Signed : False. Little book of champagne cocktails (Hardback)Title: Little book of champagne cocktails Format: Hardback Type: BOOK Publisher: Hamlyn UK Release Date: 20010914 Language: English. Authors : Gurney, Jackie. The National Trust Book of Picnics. Title : The National Trust Book of Picnics. Binding : Hardcover. Books, Comics & Magazines Other Fiction Books Other Non-Fiction Books Childrens & Young Adult Books General Fiction Books Children's Fiction Books. Used-Very Good: The book will be clean without any major stains or markings, the spine will be in excellent shape with only minor creasing, no pages will be missing and the cover is likely to be very clean. Author:Joy May. We appreciate the impact a good book can have. We all like the idea of saving a bit of cash, so when we found out how many good quality used books are out there - we just had to let you know! Title: The Italian Cook (320) Item Condition: used item in a good condition. Will be clean, not soiled or stained. Published On: 2008-10-01 SKU: 8765-9781843091905. Author:Matheson, Christie. Salty Sweets. Book Binding:Hardback. Each month we recycle over 2.3 million books, saving over 12,500 tonnes of books a year from going straight into landfill sites. All of our paper waste is recycled and turned into corrugated cardboard. Fast Pasta (Essential Cookery). Title : Fast Pasta (Essential Cookery). Authors : Anon. Binding : Hardcover. Product Category : Books. Publisher : Parragon Plus. Condition : Very Good. List Price (MSRP) : 0.99. Yotam Ottolenghi is a cookery writer and chef-patron of the Ottolenghi delis and NOPI restaurant. Author: Yotam Ottolenghi. Vegetables have moved from the side dish to the main plate, grains celebrated with colour and flair. Author: Dr Penny Stanway. The Miracle of Olive Oil. Excellent - Used book, read carefully by previous owner, looks New. Good - Usual signs of a well read book but good overall condition. Authors : Rutherford, Lyn. Product Category : Books. Binding : Paperback. Condition : Very Good. List Price (MSRP) : 2.45. Signed : False. The student vegetarian cook book by Sarah Freeman (Paperback / softback)Title: The student vegetarian cook book Format: Paperback / softback Type: BOOK Publisher: Collins & Brown UK Release Date: 19920930 Language: English. Author: Susan Gardener ISBN 10: 0517163187. Title: The Vegetarian Kitchen Item Condition: used item in a very good condition. Will be clean, not soiled or stained.